An edhat reader feels the new development proposal for 711 N. Milpas will decrease access and safety for pedestrians and bicyclists. A local resident is opposing a four-story, modern apartment complex proposed for 711 N. Milpas Street. A donnybrook took place Wednesday at the County Planning Commission meeting in Santa Maria over whether to approve a large expansion of ERG oil and gas drilling in Cat Canyon. An edhat reader shares their opinions Santa Barbara County's inspections, or lack thereof, of local oil company operations. A local resident shares their opinion on the Camp 4 land in Santa Ynez Valley and its recent lawsuits. A local school teacher discusses how the Literary Project will help dyslexic students within the Santa Barbara Unified School District. An edhat reader questions why Warming Centers have not been activated with the low overnight temperatures. An Old Town Goleta business owner strongly opposes the Property Business Improvement District (PBID) proposed by the Goleta City Council. An edhat reader opposes Aera Energy’s proposal to drill 296 new oil wells in Cat Canyon, near Santa Maria. How do we Eliminate Dangerous Eucalyptus Trees? An edhat reader wonders if local governments will remove dangerous Eucalyptus trees? An edhat reader opposes three oil companies who want to vastly increase drilling between Santa Maria and Los Alamos. An edhat reader responds to a recent Op-Ed post about the state of the historic Mission Creek Bridge in Santa Barbara. What Factors Would Improve Local Elementary Schools? A local resident is curious about the ranking of Santa Barbara Unified School District schools, including Adams Elementary. A Mission Canyon resident explains why the historic landmark Mission Creek Bridge is safe and beautiful. Ask Our Supervisors: Oil or People? An edhat reader urges residents to speak out against newly proposed oil wells in Cat Canyon. An edhat reader urges locals to protect our groundwater from oil companies. An edhat reader shares their opinion on the City of Santa Barbara's decision to approve a grant application to install 40 mobile homes for the homeless in Santa Barbara. 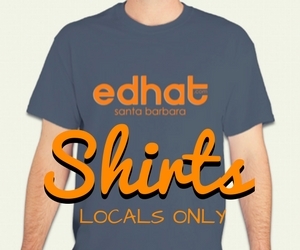 An edhat reader advocates for a ban on comment "pooling" at Santa Barbara City Council meetings. A Los Alamos resident is concerned about the safety of local water due to an increase in oil production. An edhat reader urges voters to look at candidates' experience when voting in the upcoming local elections. A local resident praises the Santa Barbara Unified School District's unanimous vote to renew its contract with the nonprofit Just Communities. An edhat reader is standing up for the members of the Santa Ynez Water Conservation District 1 amidst a controversial election. An edhat reader is frustrated with new construction on a small lot in their neighborhood. A local resident shares their opinion on Sen. Jackson's bill to require gender diversity on corporate boards. The new owners of Del Playa Rentals have donated to the local LGBTQ+ community and next week's Pacific Pride Festival following the previous owner's verbal homophobic attacks. A Santa Ynez reader questions the spending and manager salary of the Santa Ynez River Water Conservation District, while they raise customer rates, and urges locals to run for a board member seat. A local edhat reader reflects on the Carr Fire destruction in their hometown in Northern California. Local residents respond to an Op-Ed by County Supervisor Das Williams and Chairman of the Santa Ynez Band of Chumash Indians Kenneth Kahn, in the LA Times regarding HR 1491.